Traffic Jam at the Copier? 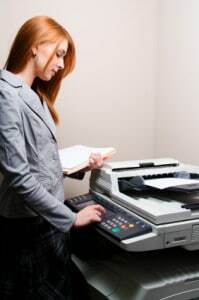 Printing off a few copies of insurance information or scanning a stack of patient records can be daunting when you have to wait 10 minutes in line at the copier. In the meantime, you can plan your weekend and all the fun things you have planned. While this is great, you probably could have spent that 10 minutes more productively. When there is a big lineup at the copier, it could indicate that your office does not have the right technology to sustain it. You are running with lower capabilities, and you could increase your productivity with an upgrade. Modern office technology has improved if you have an older copier. For example, copiers have been made to consume less energy, and in many cases, it will also use less toner. That means that you will maximize your investment because you will not have to constantly run back to buy another toner cartridge. Here at our company, we sell Xerox copiers, a world leader in office technology, and we can help you to uncover a copier that will eliminate the lineup at the copier. Don’t deal with a copier that performs beneath the capabilities of your business. It actually costs money through lost productivity.